Are we always able to receive the divine in us? When we invite friends to our home, we clean the living room, adorn it with flowers, make it as beautiful and welcoming as possible, to make them feel the warmth of the friendship with which we want to surround them. Is the same true also for the divine guest? How do we accept him in the abode of our heart? When he knocks at the door, the living room is perhaps in disorder, the floor has not been swept for several days, garments lie around on the furniture, the windows have not been washed, and the light is poor. How could the one who is the Light put up with such poverty? But there is much worse. In the back of the living room a darkened corridor opens areas where the dust of years has accumulated, and where there is a rancid smell that grips us by the throat. Certain pieces are condemned: the lock has been rusting for ages. What shameful secrets hide in those places? What skeletons are concealed in the closets? “The light shines in the darkness, and the darkness has not comprehended it” (Jn 1:5)—or has not received it, the Apostle John writes. What does such darkness mean? Is it the inner darkness that reveals the somber face of sin at work in the world, at work in the heart of people when they turn away from the one who said: “I am the light of the world”? (Jn 8:12, 9:5) In this case, the heart becomes the receptacle, or the garbage dump of what cannot be mentioned. Its depths hide the unvoiced feelings, the frustrations—everything that was bad or unloved—and also, whether one is aware of this or not, the suffering of being a sinner. A great saint said that if one gathered all the sins of humanity, they would form only one drop of water in the ocean of God’s mercy. It is time once again to honor inner discipline, effort, and prayer, to let a little bit of light shine. Life is a fight between light and darkness. The heart is in the fray of this fight. Man can be submitted to various conditionings. The latter can illumine a particular behavior, but they will never exhaust the totality of the human being. Man always keeps a bit, a spark of liberty in his innermost heart of hearts. This is why the Apostle Luke writes that “the good man draws good things from the good treasure of his heart, and the evil man draws evil things from the evil treasure of his heart.” (Lk 6:45) As the dynamic center of the person, the heart allows one to identify the latter under its veil of light, or of darkness. If it is accepted that the heart designates the deep “me,” the most intimate spot of the person, then we may begin to listen to what it has to say to guide our life, and to let it unfold freely. It is good to settle in the heart. 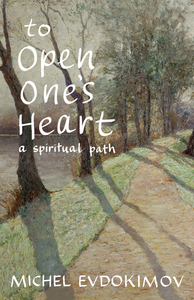 This is an excerpt from To Open One’s Heart: A Spiritual Path by Archpriest Michel Evdokimov, published by SVS Press. Emphases added.